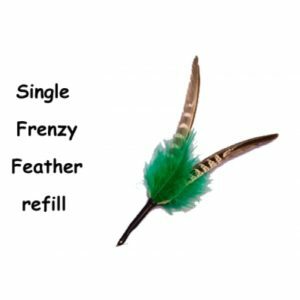 This superb refill as it spins through the air will drive your cat Bonkers trying to catch this prey! 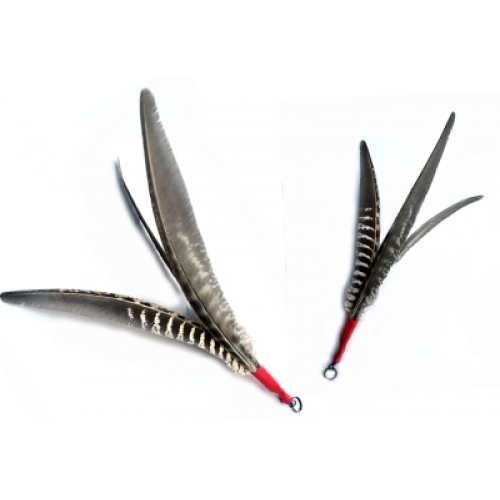 The Whirly Flyer has three pheasant flight feathers with no “bling” (ie no coloured or small feathers) to produce the spin even with slow forward motion so you can fly these slower than a standard feather attachment. All feathers are hand plucked not factory plucked ensuring a high quality and are from free range British Pheasant Birds that are free to lead a natural life outdoors before entering the British food chain. SAFETY !! Cat teaser/Interactive toys are NOT chew toys. Cat Interactive & Teaser Toys satisfy your cat’s natural hunt & chase instinct. They are designed only for human supervised interaction with your cat(s) to encourage cats to play and exercise. All the interactive toys should be put away when the play sessions are over. They should never be left with your cat to chew or destroy (as s/he would actual live prey) or left in a place where your cat can reach them without your participation. This is to protect your cat from injury and to make sure that the toys keep their strong appeal. 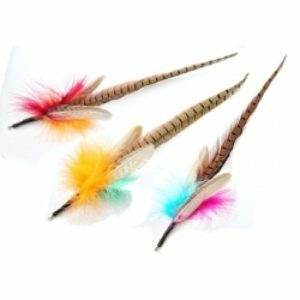 To complete a cat’s natural hunt, catch, kill, eat cycle, use the PurrSuit, Frenzy or DaBird wands and refills as hunt/chase exercise toys and some real feathers for the kill instinct and cat treats for afterwards to complete the cycle.